One of the country’s leading environmentalists made a stop in the Lehigh Valley on Wednesday, stressing the importance of civil disobedience in the fight against climate change. 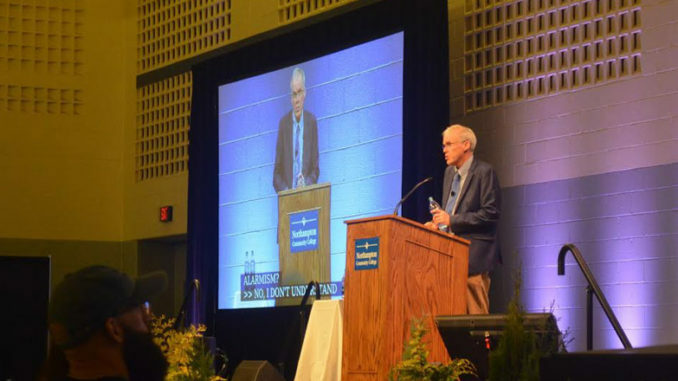 Bill McKibben, who has authored over a dozen books on the subject, spoke at Northampton Community College just three days before Earth Day to “bum people out” about the current state of the environment. McKibben opened up with a damning picture of a world with continual droughts and floods, melting ice caps, rising ocean acidity and dying coral reefs—an image of the Earth that is clear in 2017, but still dispelled by skeptics who refuse to acknowledge the most daunting problem in human existence. These conditions, he said, are a direct effect of the planet’s rising temperature. In what was perhaps his most haunting statement of the night, McKibben said stopping global warming is “no longer on the menu of options” for the human race. The only hope for sustaining the planet for future generations, he said, is to slow it down. “This is happening very very fast and it is happening before our eyes in real time,” he said. Despite being a bearer of bad tidings, McKibben offered guidance in climate activism, organizing and renewable energy to help combat these changes. McKibben praised foreign nations for their commitment to renewable energy sources, citing Denmark as an example of a nation who made use of renewable resources available to them, powering half their country by wind energy. He suggested concerned citizens gain inspiration from previous climate demonstrations, including examples of both domestic and foreign activism. He showed a stream of photos of activists from Haiti, Pakistan, the United Kingdom, noting that many people suffering the worst from climate change did little to contribute to it. McKibben seemed to encourage that guilt be felt by those living in industrialized nations that contribute most to climate change. That guilt, he implied, should be used to fuel civil forms of activism to fight back against the fossil fuel industry. He referenced the civil disobedience that led to a halt in construction of the Keystone Pipeline, which was successful for a time. Despite the fact that the new presidential administration will likely allow for the construction of the pipeline, McKibben remains positive about the effect that such civil opposition will have on the future of climate activism. McKibben said due to the time-constraints involved with the fight against climate change, there is no guarantee that environmentalists can win the fight and preserve a decent planet for future generations. But he insisted that environmentalists will not go down without a fight, a fight that will only be successful if people move beyond their comfort zones and fight a selfless battle for the future of the planet. “The planet is well outside its comfort zone now,” McKibben said. “If the planet’s outside its comfort zone then perhaps we need to be a little bit outside our comfort zones in dealing with it.